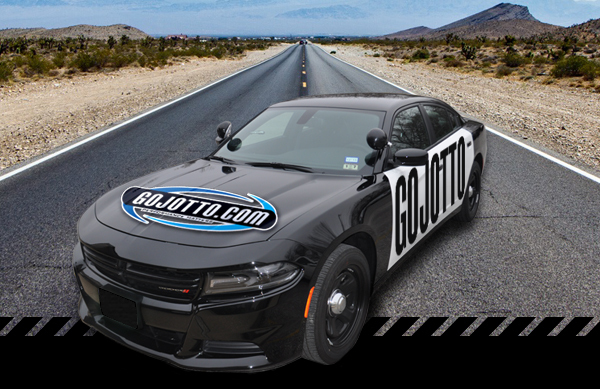 Jotto Desk offers a complete line of products for the brand new 2015+ Dodge Charger. Our engineers have worked diligently to design each of our products so that they fit and work seamlessly together. You won‘t have to worry how products will fit with each other, you can trust that Jotto Desk made this a priority from day one of each new concept. Now in our 21st year, Jotto Desk is proud to offer a variety of high quality products that are specifically engineered and thoughtfully designed to enhance the organization and ergonomics in the public safety “mobile office”...the vehicle. What makes Jotto Desk different than others is our dedication to the TOTAL vehicle. Also, Jotto Desk products ship quickly and together, meaning less freight charges than separate shipments, installation can begin faster and ultimately the vehicle can join the fleet more quickly. As the exclusive TOTAL SOLUTIONS PROVIDER, you can trust Jotto Desk as your single best source for your public safety vehicle needs. Below are detailed part numbers, prices and expandable additional information of the products which are available and are tested to work in the 2015+ Dodge Charger as well as a few of the most recent Dodge Charger model years. You can also use the "Quick Jump" links to jump directly to a specific grouping for additional information. Jotto Desk realizes the importance of the Total Solution. Maximize your workspace and optimize your time and efficiency with a Jotto Desk laptop mount for your 2011+ Dodge Charger. This computer mount, which is compatible with the vehicles’ OEM console or equipment console, is a No Holes drilled, ergonomic, articulating arm desk used as a platform for mobile professionals to secure and comfortably use a laptop computer in a vehicle. The patented Cable-Dock® securing system uses two thin nylon-coated steel cables that wrap up and over the keyboard section of the computer for a firm and positive grip. This securing system will give you peace of mind knowing that your laptop is secured. The overall design of the No Holes Computer Mount allows you to pull the desktop over for comfortable operation, reducing back strain. Stand height is adjustable and can be removed from No Holes Base in seconds when not needed. The Jotto Desk® Console Side Mount features No Holes Drilled installation on side of a compatible equipment console, this laptop desk offers a straight arm which enables you to pull the desktop over for comfortable operation, reducing back strain, providing superior ergonomics. Mobile professionals will be able to comfortably use and secure a laptop notebook computer using the Cable-Dock® securing system, while freeing up additional leg room for the front passenger. This CSM is designed for use on the 2012+ Dodge Charger CC/CD Contour Console, 425-6175 mentioned below. The Jotto Desk® Console Side Mount features No Holes Drilled installation on side of a compatible equipment console, this laptop desk offers a straight arm which enables you to pull the desktop over for comfortable operation, reducing back strain, providing superior ergonomics. Mobile professionals will be able to comfortably use and secure a laptop notebook computer using the Cable-Dock® securing system, while freeing up additional leg room for the front passenger. This CSM is designed for use on the 2012+ Dodge Charger Horizontal Contour Console, 425-6636 mentioned below. CC/CD Contour Console - 10"
This Jotto Desk Contour Console has a dash contouring shape and will mount up to 10" of equipment. Unique feature of console relocates the vehicle climate controls closer to driver in upper slot in console. Installation is quick and easy. Simply replace the factory dash insert in minutes using top-down installation. No drilling required. Console comes with 10" of faceplates. This Dodge Charger Contour Console has been designed to accommodate our CC/CD Console Side Mount, 425-5597/5215, mentioned above. The positioning of this console allows full use of the factory CD player, AM/FM radio and USB input for MP3/iPod. 2011+ Dodge Charger CC/CD Contour Console 10"
Jotto Desk offers an accessory adapter plate that provides an additional 4" of Faceplates, relocates OEM 12V Outlets (2) and USB Port for the 2011+ Charger CC/CD Contour Console (452-6175). Horizontal Contour Console - 14"
The Dodge Charger (2011+) Horizontal Contour Console has a dash contouring shape and will mount up to 14" of equipment. Simply replace the factory floor plate in minutes using factory fasteners with top-down installation. No drilling required. Each console includes faceplates and comes standard with Dual ABS cup holder and relocates the 2 OEM 12v Outlets and USB port. This Dodge Charger Contour Console has been designed to accommodate our Horizontal Console Side Mount, 425-552/5215, mentioned above. 2011+ Dodge Charger Horizontal Contour Console 14"
This (GR9-870-AR-BLM-V) is a dual weapon, vertical gun rack that mounts to partitions with flat cover panels or recessed housing. Locking mechanism for AR is positioned on gun barrel. This (GR6-11-DCR-870-AR-BLM-V) is a dual weapon, vertical gun rack for Dodge Charger (2011+) vehicles that mounts to rear seat area and is designed for use when no partition is present. Locking mechanism for AR is positioned on gun barrel. The mounting base requires no cutting or drilling, securing to existing OEM hardware. The vertical backbone is slightly offset from center toward the passenger side to allow for easier access to the weapons. This solution solves the problem experienced by many agencies that do not utilize a partition. They want to have their weapons accessible from the driver’s seat, yet there is no partition to attach the traditional gun rack to. A roof mounted gun rack interferes with Side Curtain Airbags and causes safety concerns. For those agencies – the GR6 is the perfect solution for them. In addition to these specific gun racks, Jotto Desk may also offer other gun racks. We also offer 3 Key Override options. When you are unsure, call your Sales Manager and let them go to work for you. Keep your 2011+ Charger's cargo area organized. 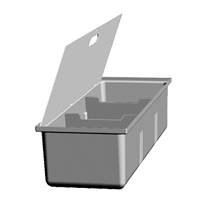 This product features a hinged top and 3 sections which can be adjusted as needed. For the 2011+ Dodge Charger, the organizer can be configured in 2 different orientations (horizontally or vertically) and/or quantities (1 or 2) if an additional Organizer is purchased. This New Modular Organizer features 3 sections for storing/organizing the clutter in the cargo area of your vehicle. Flares, scene tape, stuffed animals, medical kit, rain gear, latex gloves, hand sanitizer, evidence markers...the list goes on and on. Please see the configuration information in the Spec Sheet download for assistance in ordering. 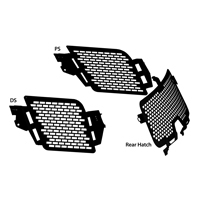 The Dodge Charger (2015+) Single Cell Lite includes the Front Divider and Center Divider. The bottom 2/3 of the rear divider and center divider is powder coated steel with a built-in HSEP for added prisoner foot room. We didn't want to give prisoners a birds-eye view of the "good guy" side of the vehicle when you don't have to. The upper 1/3 is polycarbonate and has been designed to allow for prisoner viewing/interaction but not diminish drivers view out the rear view mirror. In fact, the visibility for an officer is nothing short of amazing. The Jotto Desk Single Cell is the ultimate prisoner transport system that will have the driver smiling from ear to ear but that won’t force you to purchase more than you need. The 2011+ Dodge Charger Single Cell includes: Front Divider, Center Divider, Passenger Side Window Armor & ABS Door Panel and an ABS BioSeat, Floor Pan and Seat Belt Extenders. The bottom 2/3 of the rear divider and center divider is powder coated steel with a built-in HSEP for added prisoner foot room. We didn't want to give prisoners a birds-eye view of the "good guy" side of the vehicle when you don't have to. The upper 1/3 is polycarbonate and has been designed to allow for prisoner viewing/interaction but not diminish drivers view out the rear view mirror. In fact, the visibility for an officer is nothing short of amazing. The ABS Bio Seat & Floor Pan offer the benefit of biohazard and contraband control with easy clean up when needed. Rather than "force" our customer to take product that they don't need, the Jotto Desk Single Cells comes with Window Armor and an ABS Door Panel for the passenger side only. The Space Creator Partition Line (U.S. Patent No. 8,690,216) was designed to provide maximum room for the driver, while creating additional room for larger individuals riding in the backseat. If you have LARGE officers and if you arrest LARGE individuals...then you have just found the ULTIMATE Partition Solution on the market. Jotto Desk recognized the unused space readily available behind the front passenger seat and set about to design a partition to take advantage of this space. 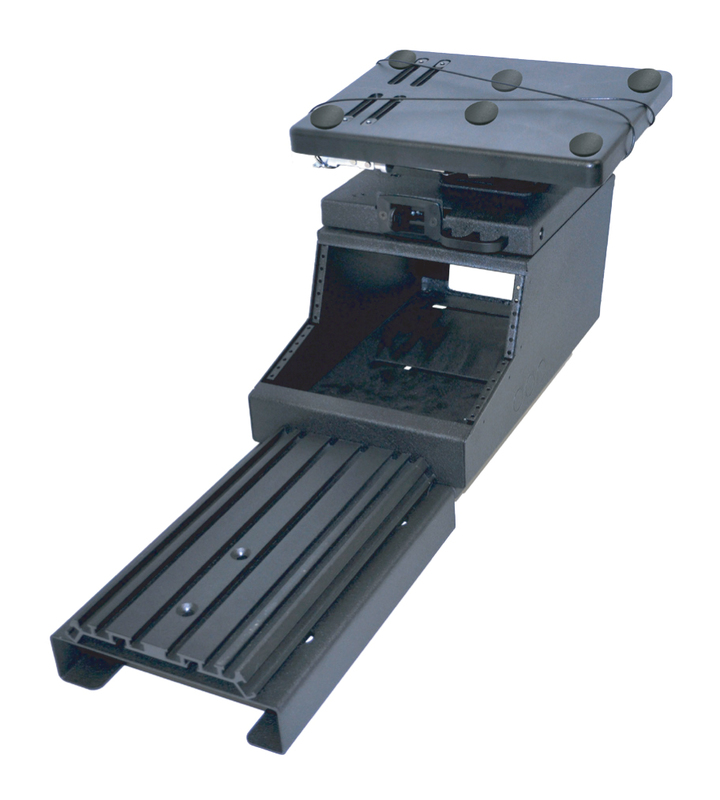 The Bidirectional Recessed Housing provides depth behind the equipment console, allowing for mounting gun racks, printers or other items. It also provides the much needed leg/knee room in order to transport larger prisoners. Jotto Desk is very excited about the Space Creator partition solution for the 2011+ Dodge Charger and the many advantages it will offer agencies. We’ve taken our patented Space Creator Vehicle Partition with Full Window and Safety Wire configuration, added our Bio Hazard Transport Seats, Floor Pans, Seatbelt Extenders, Window Armor/Door Panels and High Security Extension Panels to create an easy way to order all you need to safely transport one or two prisoners while still maximizing the front seat workspace for the officer. You can now protect your vehicles while transporting prisoners with Jotto Desk's line of Secure-Grid Window Armor and Door Panels or our Vertical Window Armor and Door Panels. The Window Armor is easy to install, reduces the likelihood of side windows from being kicked out and limits the ability for someone to reach in or out of the prisoner compartment. Door Panels protect door mechanisms, prohibit contraband from being hidden and are very easy to clean. These items are designed for a perfect fit in the 2011+ Dodge Charger. These space saving seats prohibit the accumulation and growth of body fluids and pathogens. Clean up seats quick with a spray and wipe sanitizer. When used with mating floor pan fluids can be washed down the drain hole. Drain hole liner prevents fluid from flowing underneath floor pan. The gray color of our ABS Bio Seat/Floor Pan help to reduce temperature buildup inside vehicle and the gray color provides ideal contrast to prevent contraband or weapons from being hidden. The design of the Seat Belt Extenders positions the latch at an upward angle and the steel cable keeps it in position for seatbelting a prisoner in. These Seat Belt Extenders have been submitted for FMVSS 209 Compliance Testing by an independent laboratory and have been approved. Meeting Federal Motor Vehicle Safety Standards is critical to the safety and success of this product, and we are delighted to have met that standard. The Dodge Charger (2011+) Side Mount Trunk Tray increases trunk storage in the unique trunk setup of the Charger. Fleet managers, installers and officers need a means of safely stowing a wide range of equipment in the trunk of their police vehicles. This new storage solution will help prevent damage to the vehicle and the equipment that can occur when a vehicle is in motion. The tray is constructed of steel with a treaded knob to lock assembly in place in its closed position. Unit mounts to OEM frame inside trunk. Dimensions are 14" width x 20" height. Jotto Desk is pleased to release an additional Single Cell Lite - this time to fit the 2015+ Dodge Charger. Initially released for the Chevy Tahoe and Ford PI Utility in December 2014, the Single Cell Lite solution was conceived for those agencies that liked the idea of our Single Prisoner solution but were needing a less expensive option. This solution is identical to the traditional Single Cell...except it does not include the ABS Seat, Seat Belt Extenders, Floor Pan, P/S Window Armor and P/S Door Panel. The same quality and ruggedness is still there - but the entry price is lower. Jotto Desk is confident that its' Single Cell Lite options for this vehicle will offer a budget friendly option and yet provide the safety and security that our customers rely on. There will be a Single Cell Lite forthcoming for the Ford PI Sedan. As the market's "Total Solutions Provider" (TSP), Jotto Desk continues to advance its' product line and reputation as the industry leader in public safety equipment. Jotto Desk works to redefine the mobile workspace and expand its' portfolio of high quality products and ability to deliver maximum value to customers. As your Total Solutions Provider, Jotto Desk is able to ensure that all the products we manufacture will work together seamlessly from installation to application. For more information on this and other Jotto Desk offerings, contact your Sales Manager or a Customer Service at 877.455.6886 and visit JottoPublicSafety.com. Jotto Desk is pleased to announce a New No Holes Computer Mount and Floor Plate for the 2015+ Ford F150. The Jotto Desk team has worked to ensure that the products they introduce, to its' customers, stand up to the high demand for quality, durability and functionality. Jotto Desk is confident that its' Computer Mount and Floor Plate for this vehicle will exceed those expectations and will provide the safety and security that our customers rely on. This New Computer Mount and Floor Plate are in stock and ready for shipment! Jotto Desk realizes the importance of the Total Solution. Maximize your workspace and optimize your time and efficiency with a Jotto Desk laptop mount for your 2015+ F150. This computer mount is a No Holes drilled, ergonomic, articulating arm desk used as a platform for mobile professionals to secure and comfortably use a laptop computer in a vehicle. 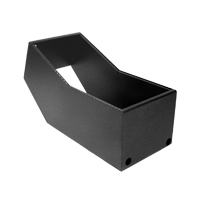 The 28" Floor Plate provides an extremely stable mounting platform to secure equipment consoles and other accessories (cupholders, arm rests, printer mounts, etc). 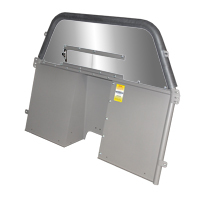 The floor plate legs are secured to the OEM structure using our No Holes Mounting System, featuring identical front/rear mounting legs and easy top-down installation. The floor plate is currently in-stock and ready for shipment. Field proven over the past 20 years, Jotto Desk offers mobile professionals the best rugged laptop mount. Made of recyclable materials, our laptop workstation creates a proven mobile office for cars, trucks, vans, SUV's and Big Rigs. Jotto Desk is easy to install, easy to set-up and easy to use. From individuals to fleets, this laptop desk will place your notebook at your fingertips when parked. For more information on this and other Jotto Desk offerings, contact your Sales Manager or a Customer Service at 877.455.6886 and visit us online at www.JottoPublicSafety.com. Jotto Desk is proud to present a new addition to the Jotto Desk Trunk Tray line. Listening to feedback from our customers that were needing a trunk tray that would allow for the easy removal of Charger's full size spare tire and easy access to the battery. Our engineers have carefully thought out the design to utilize the empty space on either side of the trunk, nearest the tail lights. That is correct, this Side Trunk Tray can be mounted on either the passenger side or the driver side...that way the one unit you have will work no matter the choice or change of mind. Typically unused space provided the perfect location to allow equipment to be mounted and stored out of the way. The new Charger Side Mount Trunk Tray (425-8106) allows the mounting of equipment onto the tray and then simply swing upwards and lock into place. Another great feature is that the mounting panel can be removed from the tray itself, allowing technician to work on equipment at a bench and not always outside with their head in a trunk. The Jotto Desk Team has worked to ensure that the products they introduce to their Public Safety customers stand up to the high demand for quality, durability and functionality. 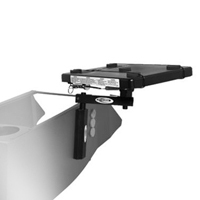 Jotto Desk is confident that its' new side mount trunk tray will be that and more. For more information on this and other Jotto Desk offerings, contact your Sales Manager or a Customer Service at 877.455.6886 and visit JottoPublicSafety.com. S.A. Crouch & Associates Inc.
Jotto Desk congratulates S.A. Crouch & Associates Inc. as our 2014 Manufacturer Representative of the Year. S.A. Crouch & Associates Inc.'s excellence in service, outstanding sales and business development efforts are genuinely appreciated. Jotto Desk is pleased to offer additional product offerings - this time to include a more cost effective solution to our Single Cell Transport Packages for the 2013+ Ford PI Utility and 2015+ Chevy Tahoe. The Single Cell solution has gained a steady following - as it creates a Single Prisoner solution and leaves the remainder of the vehicle for the good guys. However, some agencies were looking for a less expensive route - but were still needing the highest of quality. The Single Cell Lite was conceived to meet that specific need. This solution is identical to the traditional Single Cell...except it does not include the ABS Seat, P/S Window Armor and P/S Door Panel. The same quality and ruggedness is still there - but the entry price is lower. Jotto Desk is confident that its' Single Cell Lite options for these vehicles will offer a budget friendly option and yet provide the safety and security that our customers rely on. Based on the success of the Single Cell Lite - Jotto Desk plans on releasing similar solutions for the Ford PI Sedan and Dodge Charger. Jotto Desk is extremely excited to introduce Mike Tisher as our newest Sales Manager, covering the newly formed North West Region. Mike’s territory of WA, OR, AK , ID, MT, WY, ND, SD, MN, IA, NE and HI will soon discover a truly dedicated professional who brings years of sales and customer service experience to the table. This bodes well for the public safety agencies and distribution network in his new territory. His energy, desire for success and understanding of how to provide excellent service will only help to endear him to your hearts. We’ve figured out that while Mike has a laid back vibe – he is of the highest character and is an individual that is willing to do whatever is necessary to meet your needs and help spread the message of Total Solutions Provider. Mike will be working out of our Home Office in Rogers, Arkansas where he will be able to quickly and easily meet the needs of his territory on a daily basis. 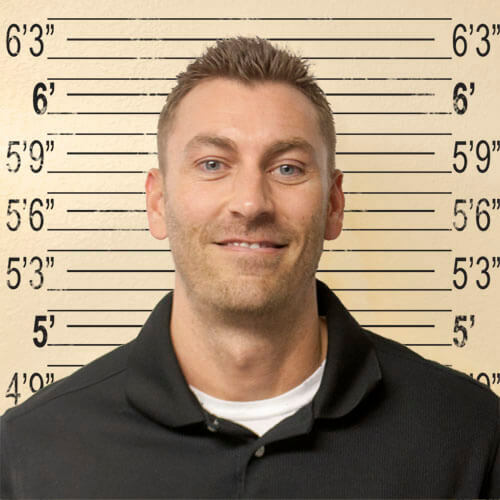 You can expect him to hit the ground running, as he’s been a Sales Associate here at Jotto Desk and he will be traveling into his territory on an as needed basis. Jotto Desk is committed to helping make your jobs easier and assisting you with your every need. 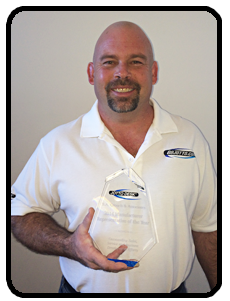 You will find Mike to be a tireless worker that will keep you on your toes and keep you smiling. His personality and commitment fall right into the Jotto Desk way of thinking. Our experienced Customer Service Department is also available to help as needed. Feel free to contact them for requests for information, part numbers, shipping/tracking information and other needs. Crystal Sandford (ext. 6401), Brenda Winberry (ext. 1964) or Debbie Rice (ext. 1975) - they will be happy to assist you. 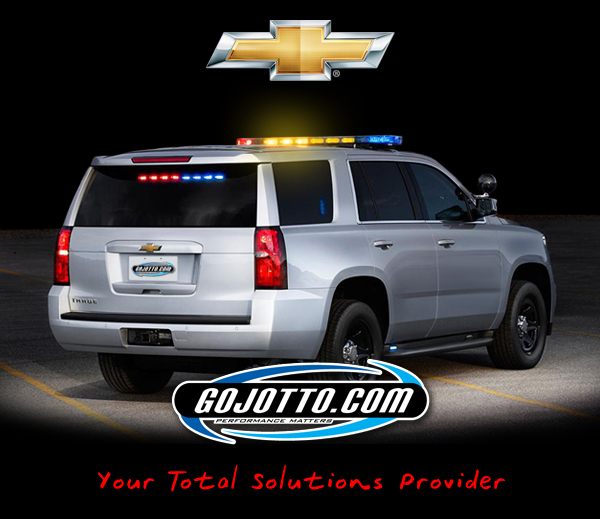 Jotto Desk is excited to announce the release of its complete line of products for the brand new 2015+ Chevy Tahoe PPV. Our engineers have worked diligently to design each of our products so that they fit and work seamlessly together. As well, all Jotto Desk products were designed utilizing the OEM CAD Data provided by General Motors, to ensure the highest quality fit and finish in this much anticipated vehicle. You won‘t have to worry how products will fit with each other, you can trust that Jotto Desk made this a priority from day one of each new concept. Now in our 20th year, Jotto Desk is proud to offer a variety of high quality products that are specifically engineered and thoughtfully designed to enhance the organization and ergonomics in the public safety “mobile office”...the vehicle. What makes Jotto Desk different than others is our dedication to the TOTAL vehicle. Also, Jotto Desk products ship quickly and together, meaning less freight charges than separate shipments, installation can begin faster and ultimately the vehicle can join the fleet more quickly. As the exclusive TOTAL SOLUTIONS PROVIDER, you can trust Jotto Desk as your single best source for your public safety vehicle needs. Lastly – in an era when some companies look for every opportunity to raise prices, Jotto Desk thinks differently here as well. We are extremely pleased to also announce that every price for the 2015 Tahoe PPV solution offered by Jotto Desk is identical to what the pricing was for the previous model. Brand New Solutions at the Old Price Point. Below are detailed part numbers, prices and expandable additional information of the products which will be available for the 2015+ Chevy Tahoe. You can also use the "Quick Info Links" to jump directly to a specific grouping for additional information. Keep prisoners in their area and in case of a crash, keep your cargo where it belongs with the CB4 Prisoner Cargo Barrier. This New Design secures behind the second row of seats in the 2015+ Chevy Tahoe utilizing OEM mounting points and provided mount brackets to the C-Pillar. No cutting of trim required and very minimal drilling is necessary. The bottom 2/3 is powder coated steel with built in mounting points and cutouts for OEM seat structure. The top 1/3 is made up of 2"x2" Safety Wire to provide security and visibility. Jotto Desk realizes the importance of the Total Solution. Maximize your workspace and optimize your time and efficiency with a Jotto Desk laptop mount for your 2015+ Chevy Tahoe. This computer mount, which is compatible with the vehicles’ OEM console or equipment console, is a No Holes drilled, ergonomic, articulating arm desk used as a platform for mobile professionals to secure and comfortably use a laptop computer in a vehicle. The Jotto Desk® Console Side Mount features No Holes Drilled installation on side of a compatible equipment console, this laptop desk offers a straight arm which enables you to pull the desktop over for comfortable operation, reducing back strain, providing superior ergonomics. Mobile professionals will be able to comfortably use and secure a laptop notebook computer using the Cable-Dock® securing system, while freeing up additional leg room for the front passenger. This CSM is designed for use on the 2015+ Chevy Tahoe Contour Console, 425-6268 mentioned below. This Tahoe Contour Console has been designed to accommodate our computer side mount (425-5542) and also have mounting locations for our armrest (425-6260). Jotto Desk offers a Truck/SUV AK-16 which combines the concept of the Tahoe Wide-Bodied console and the Smooth Glide laptop mount to create a great solution for an SUV/Truck. 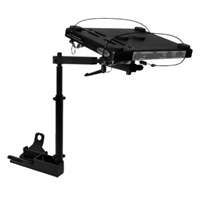 The Smooth Glide computer mount is an excellent mounting solution, for a laptop or Kodiak Mobile docking station. This new console is (14”) wide, provides four inches (4") of vertical mounting space and twelve inches (12") on the horizontal axis. On the drivers side is a knockout for internally mounting a speaker. Also included are 3 mic clips and knockouts for 12v outlets. Floor Plate Sold Separately. Also available is the 12" Workstation Console the AK-12. 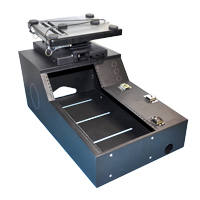 Jotto Desk offers several standard, box-style equipment console designed to mount from 9-18" of radio and communications equipment in public safety vehicles. Sloped design allows console to be mounted from dash to between seats on our extruded aluminum floor plate. Easy access top down installation uses simple hand tools and requires no drilling. 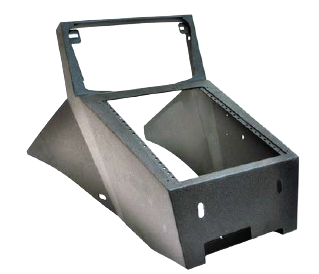 These consoles require a Floor Plate for mounting in the vehicle, which is sold separately. This new GR4 Gun Rack was designed to secure to the rear hatch and allow for multiple mounting configurations. 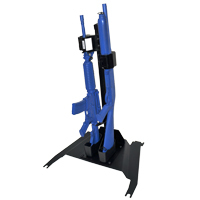 Depending on need and desire by the end user - these gun racks can be installed in such a way that the grip will be in the up, out or down position. This unique design and feature allows for virtually 3 different gun rack configurations possible...for each part number. Solutions are available for an AR-15 or Remington 870 Police Magnum shotgun. This is a dual weapon, vertical gun rack for 2015+ Chevy Tahoe which mounts to rear seat area and is designed for use when no partition is present. The mounting base requires no cutting or drilling, securing to existing OEM hardware. The vertical backbone is slightly offset from center toward the passenger side to allow for easier access to the weapons. This solution solves the problem experienced by many agencies that do not utilize a partition. They want to have their weapons accessible from the driver’s seat, yet there is no partition to attach the traditional gun rack to. A roof mounted gun rack interferes with Side Curtain Airbags and causes safety concerns. For those agencies – the GR6 is the perfect solution for them. In addition to these 15+ Tahoe specific gun racks, Jotto Desk also offers dozens of other traditional “partition-mounted” gun racks. These gun racks are available for a single weapon need or a dual weapon need (Remington 870 Police Magnum shotgun or AR-15). Several of the solutions are vertically oriented, while others are designed to be mounted horizontally. All Jotto Desk gun racks for the AR-15 feature our BLM (Barrel Lock Mount) solution, where the weapon is secured/locked at the least accessorized point. We offer 3 distinct lock heads, including an XL Handcuff Style Lock – that are sure to help meet any need out there. When you are unsure, call your Sales Manager and let them go to work for you. Keep your 2015+ Tahoe's cargo area organized. 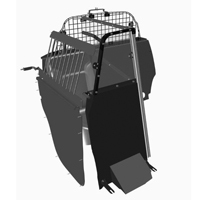 This product features a hinged top and 3 sections which can be adjusted as needed. For the 2015+ Chevy Tahoe, the organizer can be configured in 2 different orientations (horizontally or vertically) and/or quantities (1 or 2) if an additional Organizer is purchased. 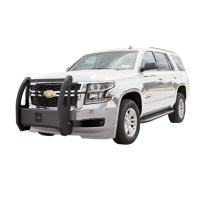 Jotto Force Push Bumper is extreme duty and offers unparalleled protection for the front of the 2015+ Chevy Tahoe. Our engineers partnered and learned from the leading manufacturer of replacement bumpers so that the Jotto Force Push Bumpers will stand the true test of time. The 2015 + Chevy Tahoe design changes slightly in that the vertical push pieces are taller and easier to see by the driver. We also utilize OEM mounting locations with no drilling required to secure the mounting brackets to the vehicles and only minor modification are needed to the OEM bumper fascia. Installs in less than 30 minutes from start to finish. The Vertical Bumper Assembly has been pre-slotted to accommodate the mounting of intersection lighting from Code 3, SoundOff Signal, Federal Signal and Whelen...so that all an installer has to do is simply bolt the lights on and run wiring (no drilling required). 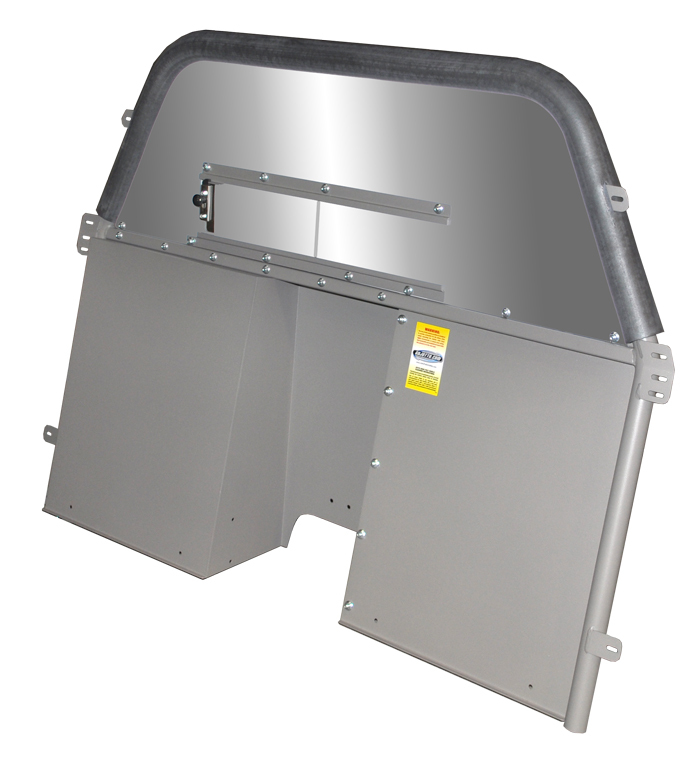 The Horizontal section of the Vertical Bumper Assembly is designed to mount/protect your siren speaker. The Rear Area Secure Grid Window Armor protects the equipment stored in the rear cargo area from being stolen in a smash and grab situation. 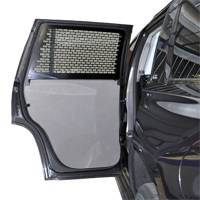 This new Window Armor secures the cargo area by providing addition window armor that covers the driver side/passenger side rear windows and the rear hatch window. Our solution doesn’t simply screw into the OEM trim – we have designed mounting brackets that secure to the vehicle behind the OEM trim and provide solid protection…not just the appearance of it. Often times, this area is a target for those looking for tactical equipment and body armor/Kevlar helmets. 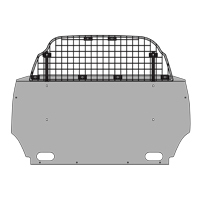 When used with the 2015+ Tahoe CB4 Prisoner Cargo Barrier (475-0863) or Single Cell (475-0864), you will get a completely enclosed storage area to protect all your equipment needs. The Jotto Desk Single Cell is the ultimate prisoner transport system that will have the driver smiling from ear to ear but that won’t force you to purchase more than you need. The 2015+ Chevy Tahoe Single Cell includes: Front Divider with built-in lower high security extension panels, Center Divider, Passenger Side Window Armor and ABS Door Panel, Rear Cargo Barrier (CB4) and a ABS Seat Cover with Seat Belt Extender.The officer/driver benefits by having 100% of the front/rear travel and recline of the driver’s seat – it’s like driving a Tahoe with no partition in it. If you have never seen our Single Cell solution in person – then you owe it to your officers, deputies and troopers to give it a look. The Space Creator Partition Line (U.S. Patent No. 8,690,216) was designed to provide maximum room for the driver, while creating additional room for larger individuals riding in the backseat. If you have LARGE officers and if you arrest LARGE individuals...then you have just found the ULTIMATE Partition Solution on the market. Jotto Desk recognized the unused space readily available behind the front passenger seat and set about to design a partition to take advantage of this space. 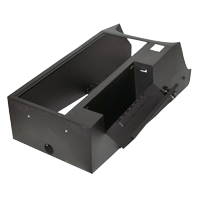 The Bidirectional Recessed Housing provides depth behind the equipment console, allowing for mounting gun racks, printers or other items. It also provides the much needed leg/knee room in order to transport larger prisoners. Jotto Desk is very excited about the Space Creator partition solution for the 2015+ Chevy Tahoe and the many advantages it will offer agencies. You can now protect your vehicles while transporting prisoners with Jotto Desk's line of Secure-Grid Window Armor and Door Panels or our Standard Vertical Window Armor and Door Panels. The Window Armor is easy to install, reduces the likelihood of side windows from being kicked out and limits the ability for someone to reach in or out of the prisoner compartment. Door Panels protect door mechanisms, prohibit contraband from being hidden and are very easy to clean. These items are designed for a perfect fit in the 2015+ Chevy Tahoe.